A series of occasional articles recalling my favourite West Ham games, and songs that topped the charts when these games were played. Today a memorable quickfire scoring feat by Brian Dear. 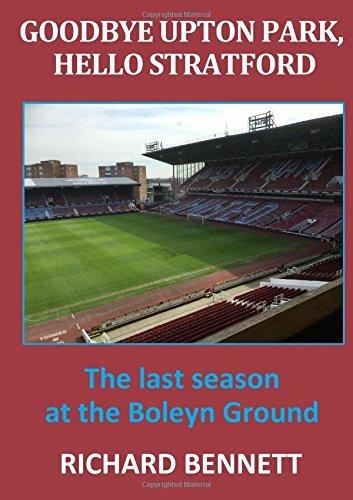 There have been so many great games in the last 58 years and many are described in my book, Goodbye Upton Park, Hello Stratford. They are remembered for different reasons, the importance of the game, the goals scored, and the spine-tingling atmosphere generated by our fans. I remember this one especially for seeing a big West Ham win, and a goalscoring feat by Brian Dear, something which I doubt I will ever see again. And growing up in the 1960s I remember fondly the music in the charts at the time. It was a “Good Friday” for me during the Easter holidays in 1965 as for the first time I was allowed to go to Upton Park with friends rather than any adults being with us. The Last Time by the Stones was in the charts but this was my first time. I was eleven. Do eleven year-olds go to West Ham without adult company these days? It was an even better Friday for Brian Dear as this was the day he scored five goals in a twenty minute spell either side of half time in our 6-1 trouncing of West Brom. I can recall a newspaper headline of the match report that I had in my West Ham scrapbook at the time. It read “Dear, Oh Dear, Oh Dear, Oh Dear, Oh Dear!” Martin Peters scored the other goal incidentally, but everyone forgets that. The following week I went on my first trip abroad, a school visit to Paris and Ostend. I remember the time very well. Dear’s first goal came just a minute before the half-time interval. Of course back in those days the half lasted for just 45 minutes. We didn’t have a board indicating additional minutes to be played for injuries, time-wasting or substitutions. When 45 minutes were up the half-time whistle was blown. If I remember correctly the game kicked off at 11am, so the half would have ended exactly at 11.45. There was only a ten minute interval in those days too. He scored four more in the first 19 minutes of the second half, the last coming at 12.14pm, making it a five goal haul in twenty minutes of football time (half an hour if you include the interval! ), a feat which I don’t believe has been repeated since. It is claimed that Aguero equalled the five goals in 20 minutes when Manchester City beat Newcastle by the identical score 6-1 in October 2015. Aguero’s goals were timed at 42, 49, 50, 60 and 62 minutes, seemingly within twenty minutes, but everyone forgets the additional three minutes that the referee added before blowing the half-time whistle. I remember the West Brom game very well, not particularly for the quality of our football, which was good of course as we won the game comfortably, but more for the fact that I realised that I was watching a very special goalscoring feat. I did witness another a few years later when I saw Geoff Hurst score six in a game. Of course, as often happened in those days, the return fixture came just a few days later (on Easter Monday to be precise). West Brom turned the tables and beat us 4-2, and no, Brian Dear didn’t score, our goals came from Ronnie Boyce and Geoff Hurst. Despite his goalscoring prowess, he never had many extended runs in the first team, and played a total of just 82 games in a seven-year spell, scoring 39 goals at a healthy average of almost one every other game. Why didn’t he play more often? He did feature in the final 15 matches of the successful European season, scoring 14 goals, and was a member of our victorious European Cup Winners Cup side just a month later on that famous night at Wembley. In addition to the The Last Time by the Rolling Stones mentioned earlier, which was a former number one on its way downwards, there were a number of top acts in the chart that week, the Yardbirds were at 2 with For Your Love, Unit 4+2 were at 3 with Concrete and Clay, Donovan was at 4 with Catch The Wind, Here Comes The Night by Them was at 5, Bob Dylan was at 7 with The Times They Are A-Changin’, and the Beatles were a new entry at 10 with Ticket to Ride, which would go on to be the number one the following week. The number one this week was Cliff Richard with The Minute You’re Gone.